Abstract: Objective To investigate the effects of X inactive specific transcript (XIST)on proliferation, invasion, and metastasis of the hepatocellular carcinoma. Methods XIST expression was analyzed by qRT-PCR in normal and hepatoma cell lines. CCK-8 and Transwell assays were performed to analyze the effects of XIST on proliferation, invasion, and metastasis post-RNA interference on the overexpression of the XIST. Results The expression of XIST was higher in the hepatocellular carcinoma cell than the normal hepatocyte (P < 0.05). Therefore, XIST overexpression may promote proliferation, invasion, and metastasis of human hepatoma cells HepG2. 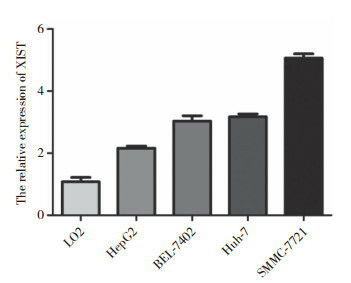 The suppression of XIST expression in SMMC-7721 cells could inhibit the ability of proliferation, invasion, and metastasis of hepatoma cells. 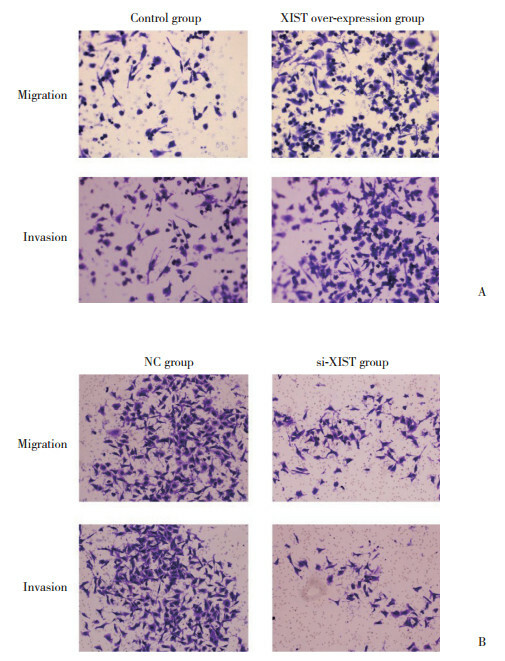 Conclusion XIST promotes proliferation, invasion, and metastasis in the hepatocellular carcinoma. SONG H, HE P, SHAO T, et al. Long non-coding RNA XIST functions as an oncogene in human colorectal cancer by targeting miR-132-3p[J]. J BUON, 2017, 22(3): 696-703.